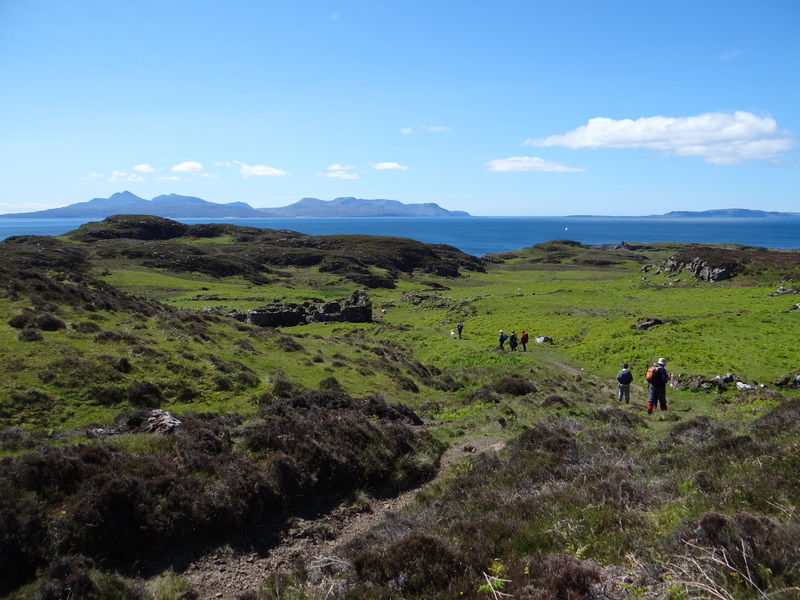 Members of NOSAS walking towards the tackman’s house on Rubh’ an Dunain. Canna is on the skyline. 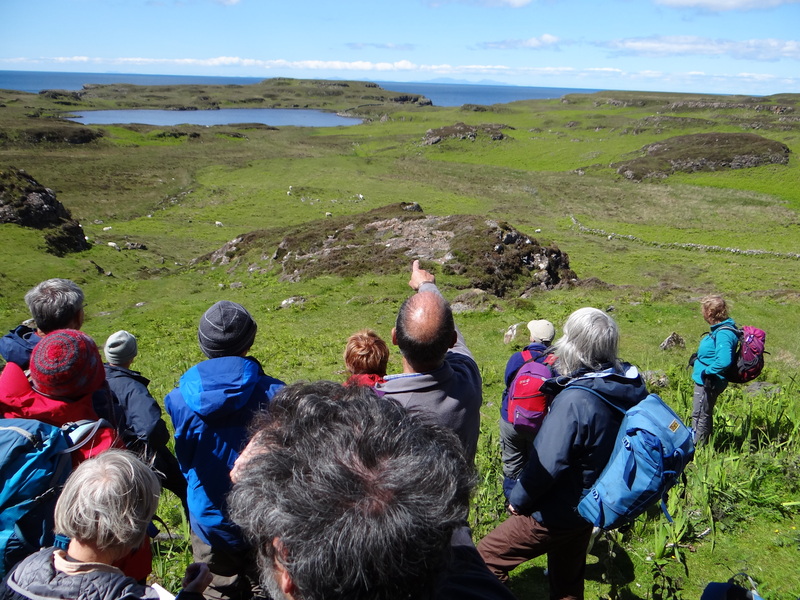 A warm sunny Sunday in early June saw NOSAS members gathering in the Glenbrittle campsite, at the foot of the Cuillin Mountains. The view south was spectacular, Canna seemed unusually close and South Uist and Barra lay in the haze on the horizon. 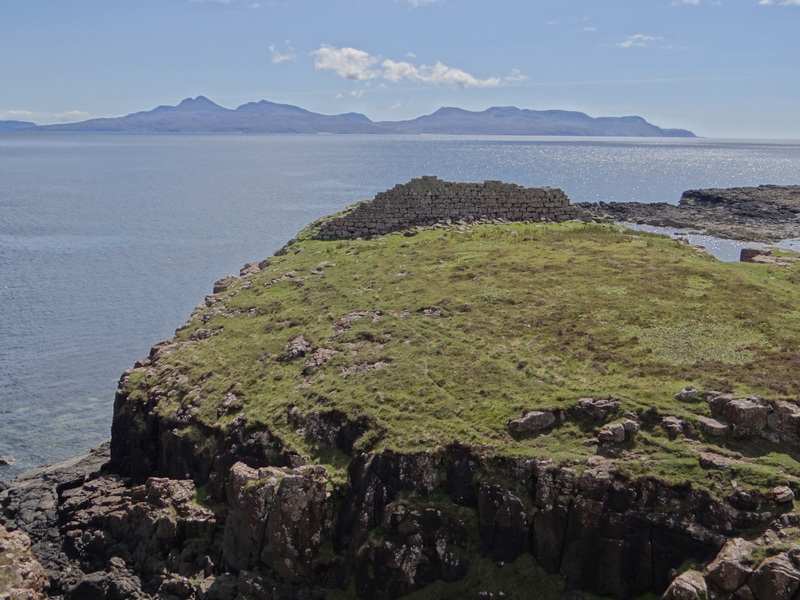 Close at hand the Rubha an Dunain peninsular stretched out to the left of the bay with a ribbon of made-up path promising an easy walk to the point where 8000 years of Skye’s history lies exposed to view. 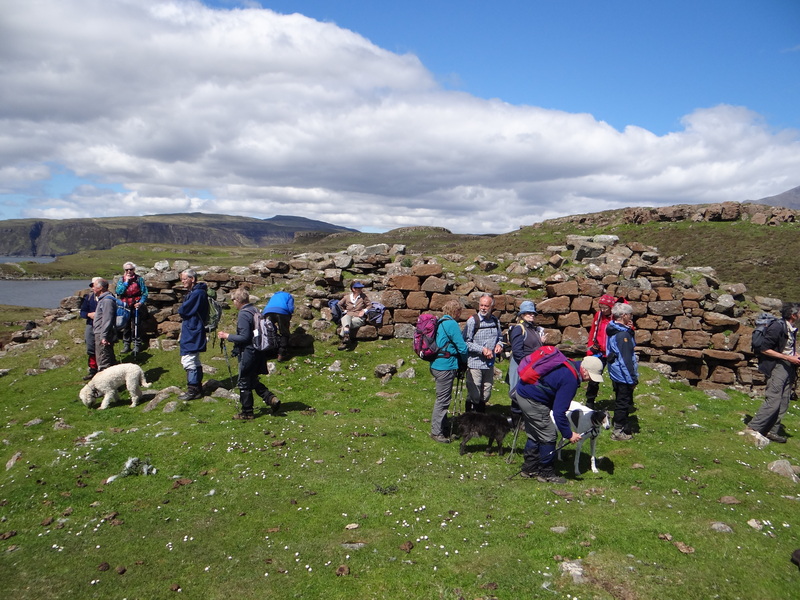 Just an hour and a half later the group paused to enjoying a mid-morning coffee prior to crossing the Slochd Dubh (Black Hollow) where a late 18th century wall marks the boundary between Clan MacAskill and Clan MacLeod – but more of that later. 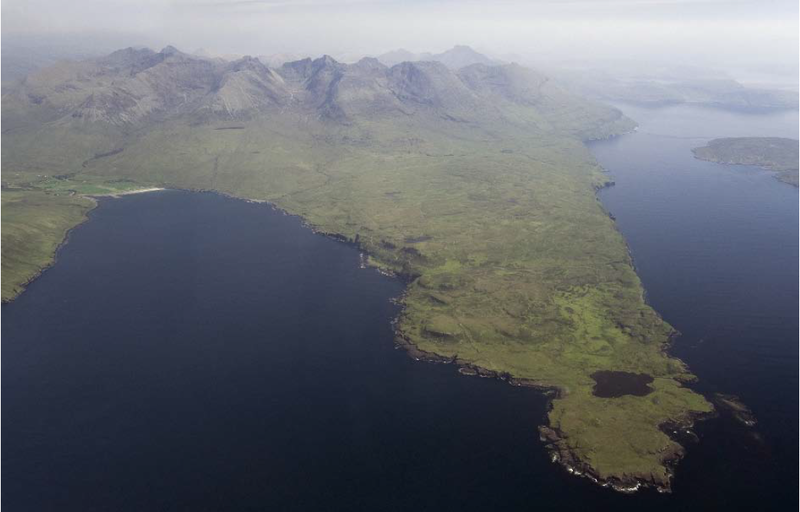 The first people to leave tangible evidence of their stay on the peninsula were Mesolithic hunter-gatherers who travelled throughout the islands off the west coast of Scotland on a seasonal round, in pursuit of food and tool resources. 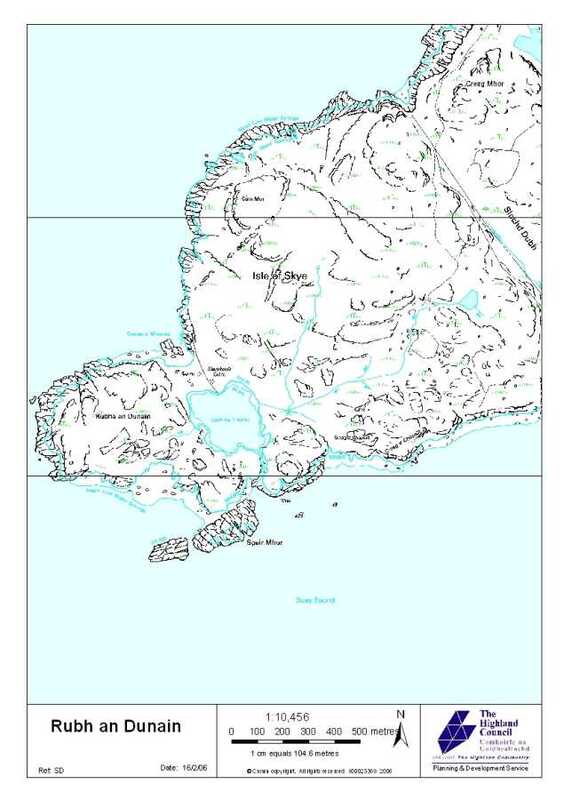 A site excavated at Kinloch on Rum (HER MHG 3987) between 1984 and 1986*, only a day’s boat journey away to the south west, may be the winter base for these pioneers. 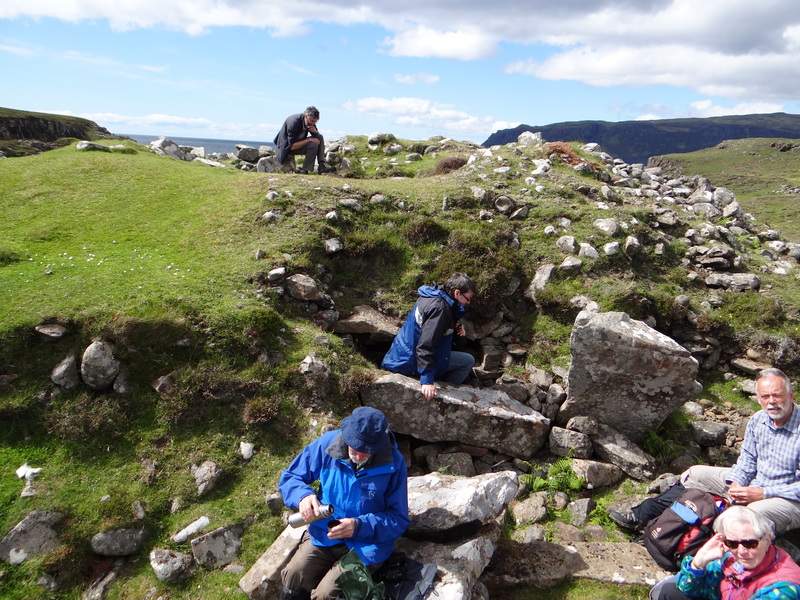 A small rock shelter (HER MHG4898) at Rubh an Dunain, partially excavated in 1932 by W Lindsay Scott**, contained many worked stone tools and the debris from their manufacture – evidence of repeated visits to the site during this period. 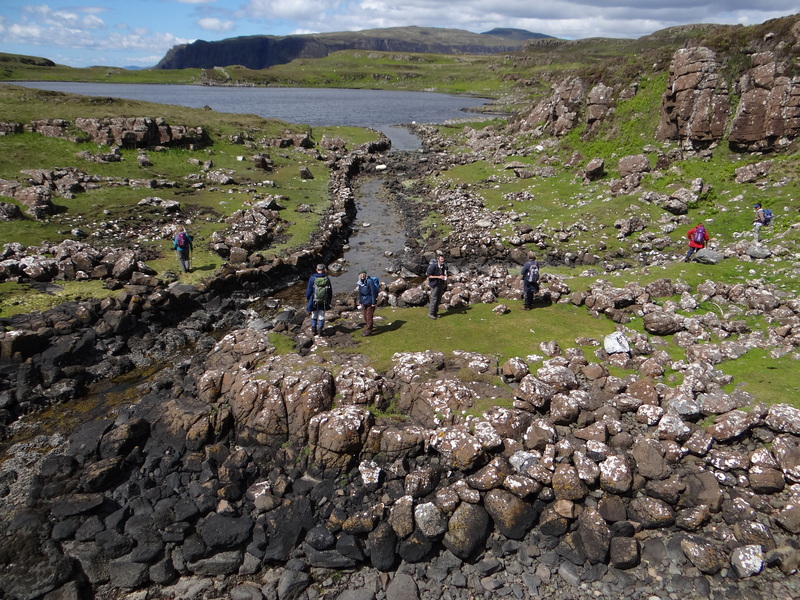 Additionally a recently recorded lithic scatter on a terrace close to Loch na h-Airde shows that more sites of this period await discovery (the day in fact finished with NOSAS members happily picking fragments of worked bloodstone and mudstone out of a nearby burn). Martin points towards Loch na h-Airde from just outside the rock shelter. 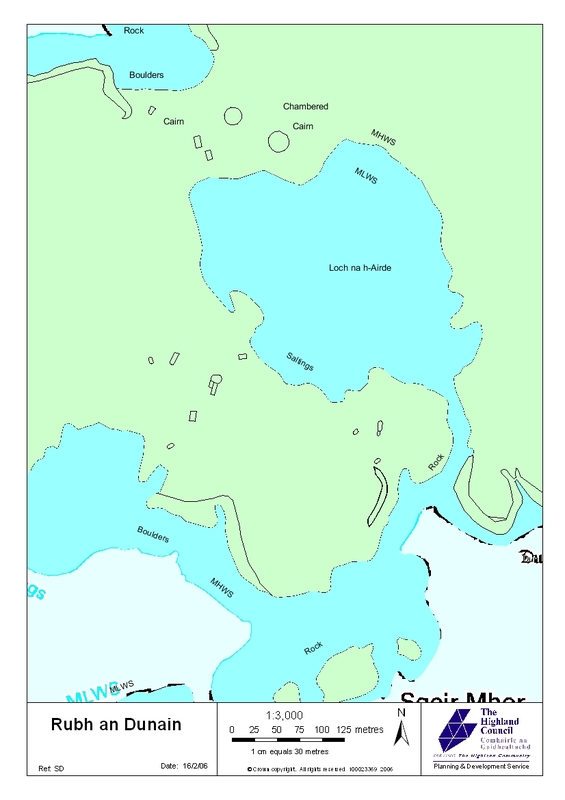 Later, during the Neolithic period, a chambered tomb (also excavated by Lindsay Scott in 1932 – HER MHG4901 and Proc Soc Antiq Scot 1932) was built on the rise at the western end of Loch na h-Airde suggesting that a settled farming community now occupied the surrounding area. This tomb which has an impressive if somewhat ruinous forecourt is constructed throughout with alternating panels of upright slabs and infill walling. 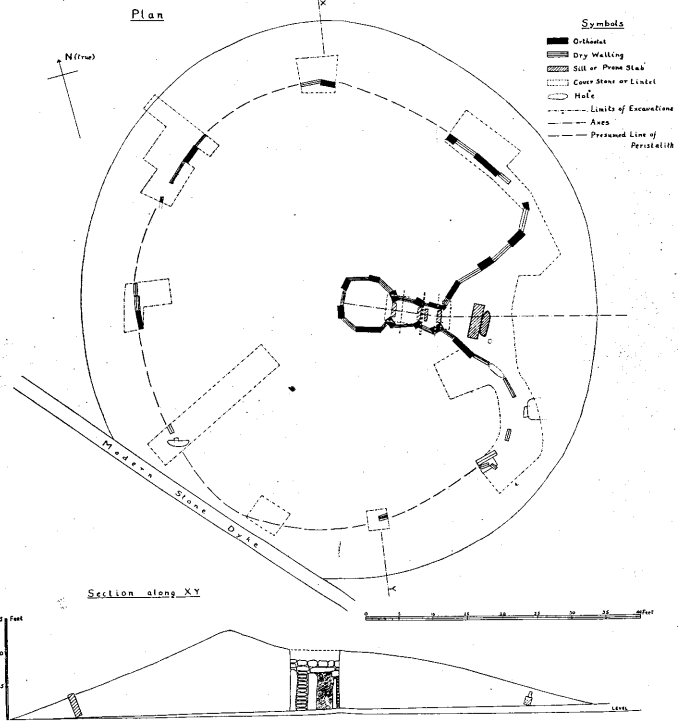 The chamber lies open lacking its upper corbeling and capstone. Finds from the tomb chamber include a beaker, presumably from a secondary burial, and many flint tools. This community appears to have continued into the following Bronze Age as a smaller cairn (HER MHG4897) some 50 meters to the west, beyond the field wall, indicates a continuation of the burial tradition in this area. 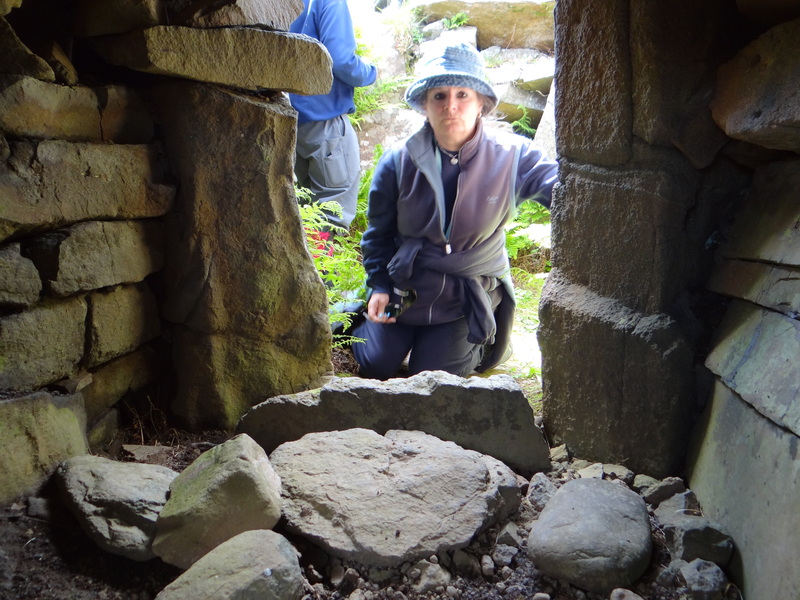 It is possible that the beaker, recorded as found in the chambered tomb, actually came from this cairn which today shows evidence of being enthusiastically opened. In addition to the burial monuments the ruins of round houses and enclosures, which may also belong to this time, have been found close by. A view into the passage way of the neolithic chambered cairn. … and from outside of the tomb. 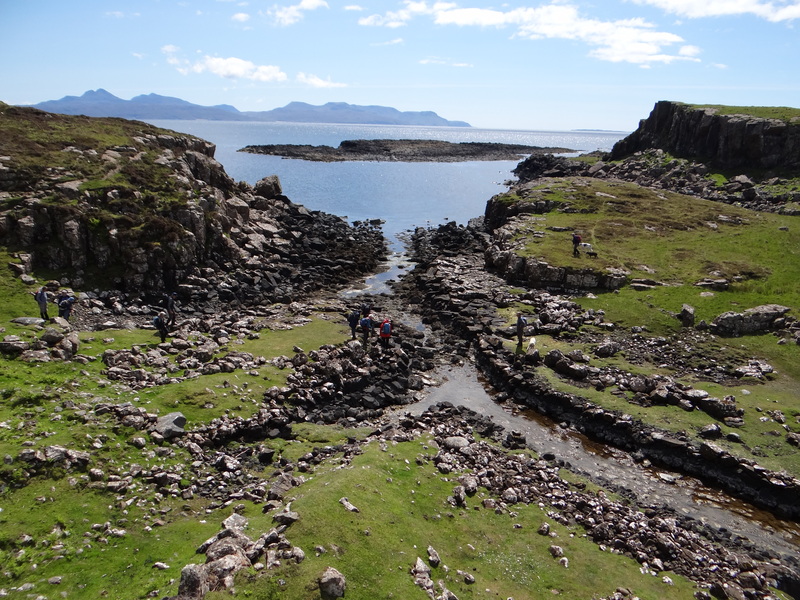 During the following Iron Age a massively built and today well preserved defensive wall (HER MHG 4902) in many ways resembling a straightened out broch, was constructed across the tip of a rocky peninsular between Loch na h-Airde and the sea. The construction of this wall created a small defended area high above the waves, suggesting that occupation continued into perhaps less settled times. At this time the rock shelter mentioned above served as a small workshop containing a smithing hearth and iron working debris – again discovered during the 1932 excavations. Looking south towards the broch like defensive wall at Rubh an Dunain. The iron age wall, looking north from inside the defended area. There are no obvious monuments on the headland from Early Christian and Viking times. However, occupation of the site appears to have continued as shown by the creation of a protected mooring in Loch na h-Airde which had been joined to the sea by a tidal canal (HER MHG 43800), and the provision of beaching slips and construction yards accessed via the canal. These improvements, although traditionally attributed to the Vikings, would appear to be related to the long lasting connection to the site, from the 12th century onwards, of Clan MacAskill who’s birlinns, until the prohibition of private navies by James I/ VI under the Statutes of Iona in 1609, served Clan Macleod as protectors of Skye’s southern seaways. After the loss of their birlinns Clan MacAskill continued to hold the tack of Rubh an Dunain as evidenced by the well preserved early 18th century Tackman’s house lying at the heart of the abandoned settlement (HER MHG5079). The clearances of the 19th century brought about the end of activity at the point with many of the MacAskills emigrating to the Carolinas and Nova Scotia. The peninsular is now run as a sheep ranch from Glenbrittle Farm. Looking north from the dun up the tidal canal. The remains of a vessel, radio carbon dated to the 12th century AD, have been located beneath the silt in Loch na h-Aird. If the vessel proved to be a birlinn it would be an extremely rare example, but this has yet to be ascertained. Looking south down the tidal canal. Two substantial nausts can be seen on the left. The iron age age dun is just out of shot on the left. The dun’s proximity might suggest that the origins of canal are in fact much earlier than the medieval period. Note: The tidal canal and associated structures are currently the subject of an intensive study led by Colin and Paula Martin. http://www.macaskillsociety.org/ which includes a virtual archaeological tour of the peninsula. This entry was posted in Bronze Age, General Archaeology, Iron Age, Medieval, Mesolithic, Neolithic, Post Medieval, Skye and tagged archaeology highlands, archaeology Scotland, beaker, Birlinn, broch, Broch wall, Bronze Age Archaeology, Chambered cairn, Clan MacAskill, Hebridean chambered cairn, highland archaeology, Highland clearances, iron age archaeology, Iron Age Dun, iron working, Lindsay Scott, Loch na h-Airde, Mesolithic rock shelter, neolithic archaeology, Post Medieval archaeology, radiocarbon dates, Rubh' an Dunain, Rubha an Dunain, Skye Archaeology, slochd dubh, tackman's house, tidal canal, Viking canal, worked bloodstone on June 23, 2015 by nosas.